Interpretation of Statutes and Documents. Dhaka: Mullick Brothers, 2009, 482 pp. ; Hardback; Tk. 550. INTERPRETATION is one of the known vehicles through which law advances in pace with the needs and demands of a given society. Importance of legal interpretation hardly needs any stressing. Interpreting laws and legal instruments is part of the job of lawyers and judges. Academics too engage in legal interpretations in class-rooms or law reviews, albeit in the process of critiquing any decisional or statutory law. Students read the subject while training as lawyers. General readers and litigants are also interested in observing the styles of interpretation of any particular judiciary. Undeniably, maturity of any country's jurisprudence is reflected in the richness of legal interpretations its legal interpretive community adopts. The questions involving legal interpretations have thus been subjects of serious legal scholarship everywhere in the world. Unfortunately, however, except for the book under review, which has been the first ever book of its kind in Bangladesh, Bangladesh's scant legal scholarship largely left untouched the subject of statutory interpretations. This is not to refute the existence of a series of judicial decisions commenting on the rules and principles of interpretation, which have now become the subject of scholarly assessment in the present book. Eloquently written by a leading and famous jurist-lawyer of the country, Mahmudul Islam, also a former Attorney General, the book constitutes a wonderful contribution to legal scholarship, appreciably closing a long standing gap in the Bangladeshi legal literature. It is said that interpretation is neither art nor science; it is a blend of both. There are rules of interpretation developed judicially and statutorily over the ages, which one needs to follow. On the other hand, how and when to interpret a law and what appropriate methods or principles of interpretation one should adopt depend much on the interpreter's legal creativity fed by their experiences, education, socio-economic background, policy preferences and moral judgment. Put in other way, the task of interpreting the law has never been a static and mundane exercise, but rather has always been dynamic and progressive. It is, however, altogether a different matter of inquiry as to whether courts are employing dynamic interpretations. These general issues vis-à-vis legal interpretations, attached by how the Bangladeshi judiciary has actually interpreted statutes and legal documents in the past years, have formed the thrust of Mahmudul Islam's book. 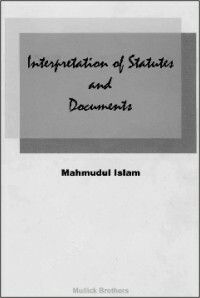 Divided into seventeen chapters, the book discusses interpretation of statutes in chapters 1 to 10, while chapters 11 to 17 are dedicated to interpretation of documents. Chapter 1 sets out the study, beginning with an addressing of the question - why it is necessary to interpret a law. The chapter also clarifies the technical meanings of 'interpretation' and 'construction', showcases the status of rules of interpretation, depicts 'constitutional aspects in interpretation of statutes', and assesses the role of the court in interpreting statutes. The author notes that “language is an imperfect medium of expression and equivocation ... cannot altogether be avoided” in law, which he considers a factor necessitating legal interpretations. The author notes that rules of interpretation are not necessarily rules of law like those in the General Clauses Act and the Evidence Act. Here the author brings in the importance of employing creativity in legal interpretation. The most fascinating aspect of this analysis, however, is that he forcefully affirms the interpretive value of the Fundamental Principles of State Policy as mandated by Article 8(2) of the Constitution which provides that these principles “shall be a guide to the interpretation of the Constitution and of other laws of Bangladesh”. Considering this as a constitutional rule of interpretation, Mr. Islam rightly comments that the courts should interpret a statute in a manner that will effectuate the fundamental principles of sate policy, but leaves it unclear whether this interpretative duty also entails a lower court. Chapter 1 then discusses a number of constitutional aspects that the interpreting courts need to be aware of. For example, the author comments that in view of the Constitution's Article 31, that is, Bangladesh's due process clause, “a statute which is vague and indefinite cannot be enforced”. This Chapter finally takes up the issue of the role of the judge in interpreting a statute, contextualising, for the Bangladeshi Court, the perceived role of the Court in interpreting a law. Thus, alongside discussing the traditional view of the Court as the finder or the mouth-peace of the law and not its creator, the author also reminds us that despite the clear language used by Parliament, Bangladesh's “Supreme Court may modify the language used in the statute to keep it within the bounds set forth by the Constitution” (p. 13). By the same token, the author draws our attention to the limits of the English principle that “when the language of a statute is plain and clear beyond doubt, it must be given effect to, however harsh and unjust the result may appear to be”. He, therefore, concludes that in view of the constitutional supremacy in Bangladesh, the courts cannot enforce an arbitrary and unjust law even if the language used by Parliament is clear beyond doubt (p.16). Chapter 2 of the book analyses several basic principles of interpretation of statutes such as that statutes if clear must be enforced, or that it is intention of the legislature that needs to be applied. In discussing these principles, the author has critically examined a series of Supreme Court decisions in which the Court made observations on principles of interpretation. The third chapter deals with a number of presumptions that the courts often take while construing a statute. Among the eight presumptions discussed, two important presumptions may be mentioned here: “[p]resumption against ousting established jurisdiction”, and the presumption that “[s]tatutes do not violate principles of international law”. In discussions under the rubric of the latter-mentioned presumption, the author would have done better by detailing the approach of the Bangladeshi courts towards international law rules while interpreting domestic laws. Titled as 'Meaning of the words in statutes', Chapter 4 examines technical meanings of various words that are used in statutes. For example, the dynamics of non-obstante clause (the clause that begins with the term notwithstanding) or conjunctive and adjunctive words have been assessed there. There is, in this Chapter, a natural cross reference to some of the previously discussed principles of interpretation. Chapter 5 deals with several methods of interpretation such as the literal method, harmonious construction method, purposive construction method and as so forth. I think this chapter would better fit next to the chapter on principles of interpretation since methods and principles of interpretation are complementary, and discussions on them are to some extent inevitably overlapping, which has happened in the case of this book, too. Chapter 6 takes up an examination of the 'internal aids' to interpretation, that is, how and to what extent internal limbs of a statute including the preamble, headings, or marginal notes can be utilised in reading out a suitable construction of a statute or its provisions. The next chapter, Chapter 7, is logically about the use of 'external aids' in the construction of a statute. The chapter discusses the value of such aids as academic woks/text books, dictionaries, judicial and other practices, parliamentary debates, statement of objects of any statute. Fascinatingly, this chapter also comments on the statute-imposed construction of words, and on the leverage the judge has in departing from such construction in order to suit the needs of a definitive context. Chapter 8 is devoted to the issue of interpretation and judicial enforcement of delegated legislation or by-laws or administrative regulations, and has at the end a section on how the concerned Department of the administration interprets such subordinate legislations. Chapter 9 deals with the interpretation of time of commencement of a statute and of the ambit of its operation, while Chapter 10 examines the issues of interpretation involving the 'expiry and repeal of statutes', discussing, among other things, the impacts of repeal or expiry of a statute on rights of those affected and on the validity of a subordinate piece of legislation. Chapter 11 launches the second prong of Mr. Islam's book, i.e., Interpretation of documents, and first takes up the general rules of interpretation of documents. Of many issues discussed in this chapter, prominent are the question whether the Court can travel beyond the words of a document or the 'intention' of the parties to it, and the relationship between the 'law' and rights granted through a document. Chapter 12 is about how ambiguities and equivocations in any document are to be removed or minimised. Chapter 13 essentially discusses the effects of alternations and erasures, material or simple, in a document. Chapter 14 details the established rules relating to the admission of parole evidence (oral) and extrinsic evidence vis-à-vis a written document, and the ascertainment of implied terms of a document. Chapter 15 studies the rules relating to the determination of time and dates that are often used in legal documents, while Chapter 16, the shortest of all, examines the rules concerning the names used in documents and misdescriptions of names/facts. The final chapter, Chapter 17, analyses the rules relating to the interpretation of individual parts of a deed and includes a treatment of various rights-generative or normative terms of legal documents. Before departing, I must acknowledge that the book is too well written and superb in clarity to attract any serious criticism. Apart from few stylistic deficiencies, the book is almost free of errors. Argued in enviably lucid language, this is an extremely readable work accessible even to those non-proficient in law. I would, however, like to make one or two observations ensued from my exceedingly high regards for, and an expectation from, Mahmudul Islam's scholarship. As we all know, despite a general trend of liberal and purposive interpretations across the globe, there have yet been interpretations in judicial tribunals everywhere that are swayed by legal formalism and sometimes unresponsive to specific local needs. How does one explain this sort of scenario, or, what are parameters within which that need to be analysed? What actually is the style of judicial interpretations of law in Bangladesh? Is it formalism-inspired, or forward-looking or dynamic? An exclusive section in the book covering these issues or a general concluding chapter underpinned by conclusions about the style of legal interpretations in Bangladesh would have perfected the book further. Second, a list of cited cases and a bibliography would have provided a ready reference for future researchers. The book is a must-buy for everyone interested in the Bangladeshi jurisprudence and judicial activity, and will no doubt prove a valuable resource for students, academics, lawyers, and judges alike. I would like to finish by congratulating the author for this brilliant imprint of his legal scholarship. Dr. Ridwanul Hoque is Assistant Professor, Department of Law, University of Dhaka.